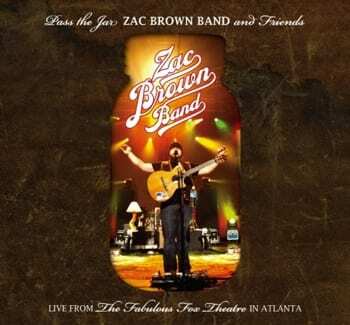 Zac Brown Band is prepping the May 4 release of a DVD/2-CD package called Pass the Jar. The concert DVD is from the band’s Oct. 30, 2009 superstar show at Atlanta’s Fox Theatre which benefited the rebuilding of Athens, GA landmark, the Georgia Theatre. The Pass the Jar DVD will feature eighteen performances, with ZBB alongside guests Kid Rock, Little Big Town, Joey + Rory, Shawn Mullins, Angie Aparo and Aslyn. The show includes songs from the ZBB’s platinum album The Foundation, their favorite covers, and new unreleased material. It was shot in HD and directed by Darren Doane (who also shot the band’s videos for “Toes” and “Highway 20 Ride”). The Pass the Jar 2-CD companion will include audio from the DVD as well as six other tracks. Fans who pre-order Pass the Jar will get access to pre-sale tickets for ZBB’s homecoming show at Atlanta’s Verizon Wireless Amphitheatre on May 8.